Vespa Lx Pink Special Edition, originally uploaded by vespaofficial. I will *not* buy this. It is $4,000. The sun must shine in Baltimore!! Go for it. *squeals* buy it buy it! I feel your pain. How about a flamingo pink banana seat bicycle as the downmarket but even mroe environmentally-friendly option, no? A can of spray paint after hitting the yard sales and you’d be set. 😉 BTW my bike helmet very famously settles my hair, maybe too much come to think of it, but oh well! I do live in scooter country and would dearly love to drive this but where would I put the 3 teenage boys who don’t have driver’s licenses or the groceries! But wait, the boys will grow up and leave (eventually!). With them gone, I could probably squeeze $4,000 out of the grocery bill. Forget the red & purple hats. 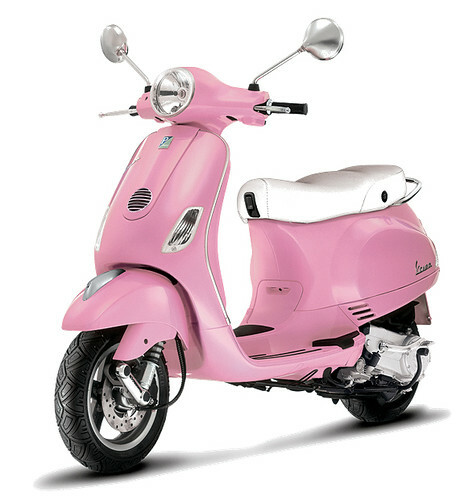 When I grow old, I will ride a PINK VESPA!! ….but I can *SO* see you riding it!!! Remember, it’s your obligation to help the economy and the environment. Sigh. I so want one of these. Logic…what ARE you trying to use logic? I want one and I’m going to get one. Maybe not today but someday in the near future. When will you be taking delivery? I want one! I want one!…do we have to be all reasonable about EVERYTHING? Since when has Logic and Common Sense applied to pink scooters? Feh! Hair will bounce back – that’s what the Baltimore humidity is for. And it need not be your sole means of transportation. Scooters are Summer Transport. Personally, I’d prefer it in aqua, but that’s just moi! There’s a lady who rides one of these to work. She even has the matching pink helmet. I am so envious! it is pink. But it does rain in Baltimore. A lot. Which is why Baltimore does not look like Phoenix. But it’s soooooo cute! I live in a scooter-friendly city and have seen this in action, very cool. Years ago (before kids) I had one to get around to my freelance jobs in Center City Philadelphia. Yes, it rains in Philadelphia, and yes, it was stolen twice, but it was SO MUCH FUN! You’re young single and gorgeous for too short a time. Don’t give helmet hair a thought! I hope you get it and sew adorable edgy outfits to wear while riding. When I am a mega cool 80 year old, I am going to be seen all over town riding one of these babies! I say you need one. I briefly considered a scooter a few years ago (it was funny how I justified the purchase to myself) and it was funny how many used ones there were on craigslist (at least in richmond) that had only been driven once or twice but had a few scratches because someone had tried to ride a couple times, fallen over, and given up. But, it is really cute! The helmet thing would ruin it for me. Oh pooh, so it snows. I saw (and knew) people in Edmonton, Alberta with scooters and it’s full-on winter there 6 months of the year and a helluvalotta more snow than you will EVER see in Baltimore! And helmets come in different sizes – and you could get a pink one to match the scooter! Seattle (a city that resembles a carwash at times) has plenty of these beauties zipping around. I’m not sure you can use logic in discussing things you want this badly. And think of the jacket you could make to wear with it. You crack me up! I am laughing so hard there’s no sound about the AKA comment! My good friend here in Montana, with all the snow and ice, rides her scooter ten months out of the year, more if the roads are dry. It gets wayyyy below zero here. Too bad that you don’t buy it, because it is so cute!!! We have a Vespa in Paris but I wish it were pink! Anyway it makes a nice picture for showing your designed clothes. I just did some pics on the Vespa yesterday in front of the Eiffel Tower! Pics on the Vespa in front of the Eiffel Tower?! I am beyond jealous. I understand the lust, really I do.. But it rains in Baltimore, a lot, and it snows. Even if you were to overcome that problem however, there’s a worse matter. In France, I know the statistics are that deaths on motorized 2-wheelers are 150 times more than in cars. That’s not a typo, one hundred and fifty times. And we’re talking about a country where the car death rate is very significant, comparable to shootings in the worst neighborhoods in the US. Now it’s true you’re a girl, and sensible, and older, and would not drive like a maniac yourself. But at most that’d only buy you a death rate 75 times more than in a car. Most of it by head injury, so the helmet and the hair is a real additional problem. Just do it! I saw one just like it here in my town and didn’t……alas, I am now sad…..if you do it you can post pic’s and I can live vicariously through you!! Oh you so have to get this!!!! Heck, I have to get this!!! so – did you order it yet?